Say you are a service provider – consultant, designer, coder – and somebody offers you startup equity in exchange for professional service. I pondered this question after seeing it on Quora. 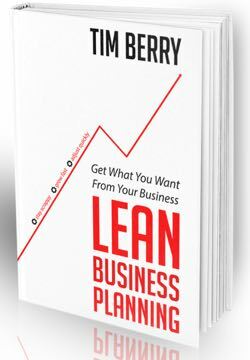 I turned back to decades as a consultant, and decades dealing with startups, to come up with this sure-proof service for equity formula. Try it. You’ll be glad you did. I dealt with this problem a lot during my consulting decades. I was based in Silicon Valley from late 1970s through early 1990s, doing business plans, business planning, and market research for high-tech companies (Apple Computer more than any other) and startups. No big established company ever offered me equity – meaning a portion of ownership – for my services. Several startups did. I was gullible and optimistic. I worked for several startups, as a consultant, for small pieces of ownership. I learned the hard way that startup equity is an extreme long shot, million-to-one odds at best. It got so bad that I promised my wife that I would never consult again for equity. But then something happened to trip me up. One of my service for equity clients took off. It became a big success. And I had equity. So I made a lot of money with it. Oops, There went the assumptions. First: you decide what you’d charge without the equity offering. Call that the fair value. Second: figure out the minimum that you’d charge in order to not hate yourself, your client, and the job if the equity works out to be worth nothing. Call that the absolute minimum. The kicker: consider whether or not you like this client, like working with him or her, will learn from the job, and experience you can gain. Rank that as a number between 1 and 10, in which 1 is a very positive job and relationship, with a lot to learn, and the pleasure of working with somebody you want to work with; and a 10 is that total idiot client you can’t stand working with, you don’t respect, you don’t learn from, and is likely to hassle you for more work for less money. A 1 is somebody with whom you’d work for free if you didn’t need the money. A 10 is a loser who makes your life miserable. Call that number the “life is too short” ranking. But wait, what? You’re noticing, I hope, that I’m entirely ignoring the alleged value of the equity involved. What a dufus! This whole thing is about the trade of service for equity. Right? No. This is the real world. The odds on a startup getting from this point to having its equity actually worth money are about one in a million. Make your decision based on the life is too short ranking, not the value. Startup equity is so unlikely to ever generate real value that you can’t survive in a professional service doing your work for equity. Believe me. Do the ones you’ve ranked 5 or less on the life is too short scale for the absolute minimum. Do those you’ve ranked 6 or 7 on the life is too short scale for the fair value. 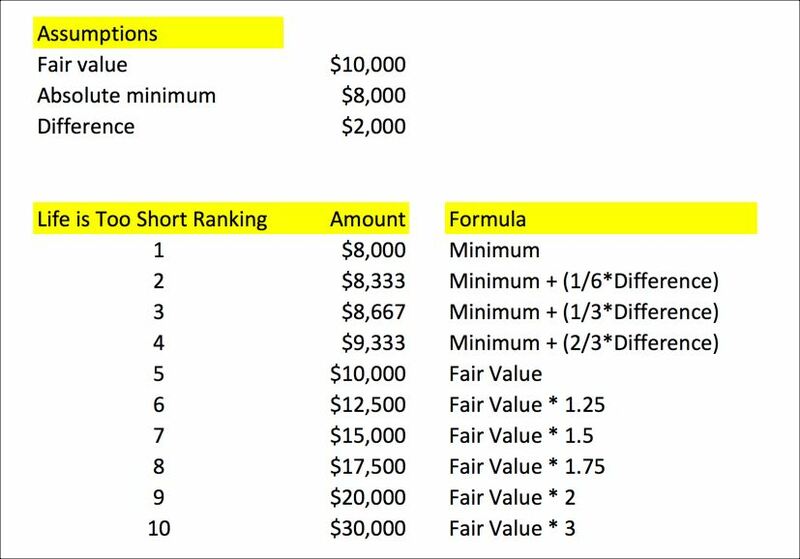 Do those you’ve ranked more than 7 on the life is too short scale for exactly what the formula says. Why? That makes no sense, you say? You do it that way because in those cases, you’re wrong. They are far less likely to succeed than you think. People who rank that high on the life is too short scale end up messing up their opportunities, and failing. But how do you charge 2 or 3 times market value? 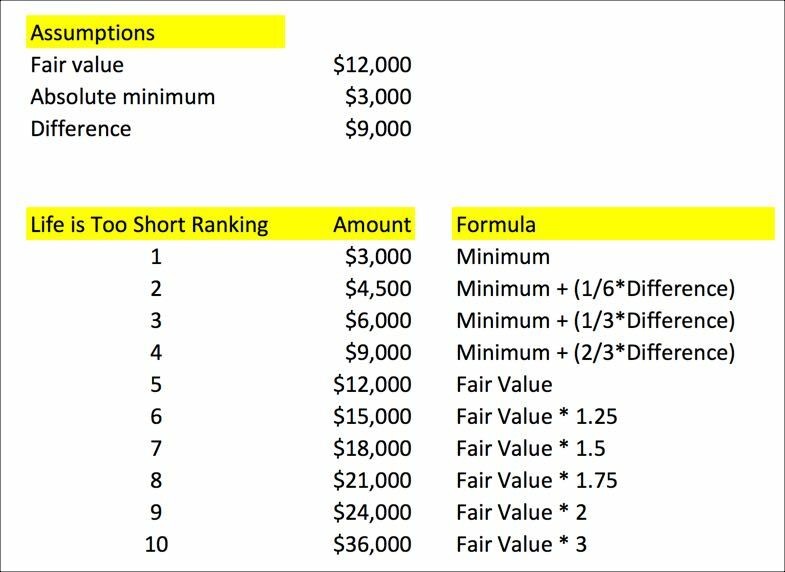 Of course you won’t be able to charge what my formula suggests for the clients in the 7–10 range in the life is too short ranking. That’s okay. You don’t want those clients. They kill your productivity for the other clients you do want. So you price so high that if – heaven forbid – they do say yes, at least your pricing has made it worth it. For the record, this post started as my answer to this question on Quora: My client wants me to work partially on equity, how do I calculate my costs?